With regards to political campaigns, the Internet has attracted the attention of politicians, researchers and the general public. During the last years the medium has developed into one of the most important – if not the most important – channel of communication during political elections, and it has even taken over the place of television as the main source for news and information for potential voters (Gueorguieva 2009). Politicians and their teams are taking advantage of many different online platforms for communication in order to mobilize voters, such as web sites, e- mail, blogs and, to an increasing degree, social networking sites. With more communication happening online, rather than in traditional media, it is easy to become overwhelmed by all the different messages and sources of information. One of the features that is unique to the Internet, in comparison to traditional media, is that it consists of several diverse yet interrelated platforms of communication. 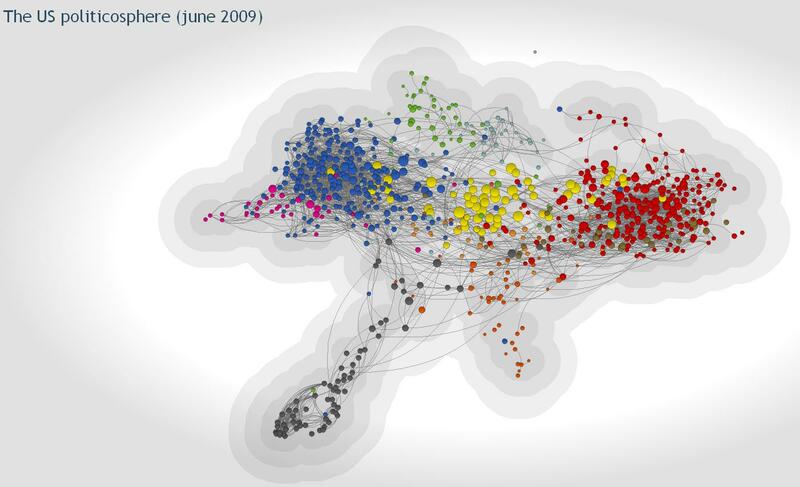 Analysts have attempted to map the different spheres that make up the Internet and many visualizations in the past decade have been fruitful as they have helped to make sense of abstract data, such as networks (Few 2009). One example of a way to visualize the Internet is the Politicosphere Map, showing the political web in the United States. The map includes 612 influential websites and blogs. Each node on the map represents a website, and the sizes of the nodes are determined by the number of inbound links. As the Internet continues to develop and new platforms appear, political communication also evolves by taking advantage of these new platforms. Social networks represent the latest trend online and sites such as YouTube, MySpace, Facebook and Twitter have achieved astronomical success. The huge popularity of these sites has inspired politicians to take advantage of them in their political campaigns, focusing on their potential to mobilize voters and expose them to ads and other information at little or no cost. It is not only party members who use social media to spread political opinions. Actually, social media is largely driven and supported by user-generated content. Thus, anyone who feels they have an opinion to share or a newsworthy item can communicate online, often to a large, attentive audience. As a result of these online political activities, scholars are conducting an increasing number of projects that attempt to clarify data gathered from social network sites. Researching the online behavior of individuals and political parties has proved daunting in the past as scholars conducting Internet research initially believed that information gathered online was not always representative of offline conditions. However, this attitude towards Internet research is changing as several research projects have shown that digital interactions supplement rather than substitute offline actions (Rogers 2009). One of the platforms that has received attention in this respect is the micro-blogging site Twitter. This platform provides an easy way to survey online chatter, and to recognize trendy topics both locally and globally. An example of how Twitter data is being used in connection to political elections is the visualization The Elections Will Be Tweeted which shows the number of posts on Twitter related to candidates running for governor or the Senate in the elections in the United States 2010. Although this way of visualizing data certainly contributes new insight into political communication, new issues have also arisen. On one hand, some analysts argue that a visualization can influence the phenomenon that it is depicting. There is a growing concern that the Internet is a place where “the rich get richer” in the sense that attention generates more attention. This is often mentioned in connection to algorithms of search engines, especially Google, which lists the most popular sites first when one searches for a keyword which, in turn, can result in the growing popularity of that site. As such, it is not unthinkable that something similar can be the case in other online realms. A popular politician or partiy may receive more attention than his less well-known opponents. If this is then highlighted by information visualizations it can lead to a self-reinforcing cycle where only a few actors gain more and more attention. Media attention does not necessarily have to be positive (unless you believe that all PR is good PR). However, the result could still be that some actors dominate the media scene, while others are marginalized within the public debate. On the other hand, one may also highlight the possibility that less well-known candidates can benefit greatly from online modes of communicating as they are relatively low cost in comparison to traditional media such as television (Gueorguieva 2009). Thus, the Internet may be regarded as a democratic sphere because attention is not as dependent on financial means, but rather a well-thought out online strategy. Another possible pitfall of information visualizations based on online data is the possibility of manipulating the data. When collecting data for visualizations it can be easy to know what the data represents, like a word or a link, but one cannot always be sure of the context or the author. The political environment is fast to pick up new trends, and also eager to maximize its potential. As campaign staff members become more technologically savvy, they might be tempted to interfere with data, those used by others or themselves, in order to influence the message of visualizations or other representations of information. The online political sphere is expanding rapidly and inspiring both professionals and the general public to interact with the available data created by people using different platforms or applications. The result is that we are seeing an increasing amount of projects which attempt to visualize political communication. These projects are revealing interesting information about current political trends and it is also showing connections that might not be visible in other ways. However, there are also issues occurring with this new way of displaying data. Unfortunately, these issues have not gained the attention that they deserve yet and I believe it is the responsibility of media scholars and online analysts not only to use the information found online, but to also clarify its context and meaning. Gueorguieva, Vassia. “Voters, MySpace and YouTube The Impact of Alternative Communication Channels.” Politicking Online the Transformation of Election Campaign Communications. By Costas Panagopoulos. New Brunswick, NJ: Rutgers UP, 2009. 233-48. Print.